In the post-operative setting, hospital-acquired pneumonia is the predominating type. HAP is a pneumonia that has onset >48hrs since hospital admission and was not present on admission. Whilst incidence varies across countries, they remain a major burden on healthcare services. A ventilator associated pneumonia (VAP) is a hospital acquired pneumonia that occurs >48 hours after tracheal intubation. It is the most common hospital acquired infection in patients receiving mechanical ventilation, accounting for around 50% antibiotics given in ICU setting. They are most common in those who have an endotracheal tube in-situ, as the tube interferes with the normal protective upper airway reflexes, prevents effective coughing, and encourages aspiration of contaminated pharyngeal contents. Patients with hospital-acquired pneumonia classically present with a combination of cough (productive or non-productive), dyspnoea, or chest pain. However, many post-operative patients may not present as ‘clear-cut’ as this, due to factors such as intubation, reduced consciousness, or other co-morbidities. Indeed, the only clinical features may be a general malaise, pyrexia, or impaired cognition. On examination, patients may have a reduced oxygen saturation, increased RR or HR, pyrexial, or with features of a septic response. Bronchial breath sounds (localised or diffuse) and inspiratory crackles may be heard on auscultation, associated with a dull percussion note. The differential diagnoses for pneumonia include acute heart failure or acute coronary syndrome, PE, asthma or COPD exacerbation, pleural effusion or empyema, and psychological (e.g. anxiety disorder). Any suspected pneumonia should have routine bloods (FBC, CRP, and U&Es) taken, which may show evidence of an inflammatory response (raised WCC and CRP). An arterial blood gas may be required in severe cases of oxygen desaturation; this may show a type 1 respiratory failure, or a type 2 failure (if exacerbating pre-existing COPD). If the cough is productive, a sputum sample should be taken for culture. Any signs of a severe infection or sepsis should warrant blood cultures being taken during times of pyrexia. 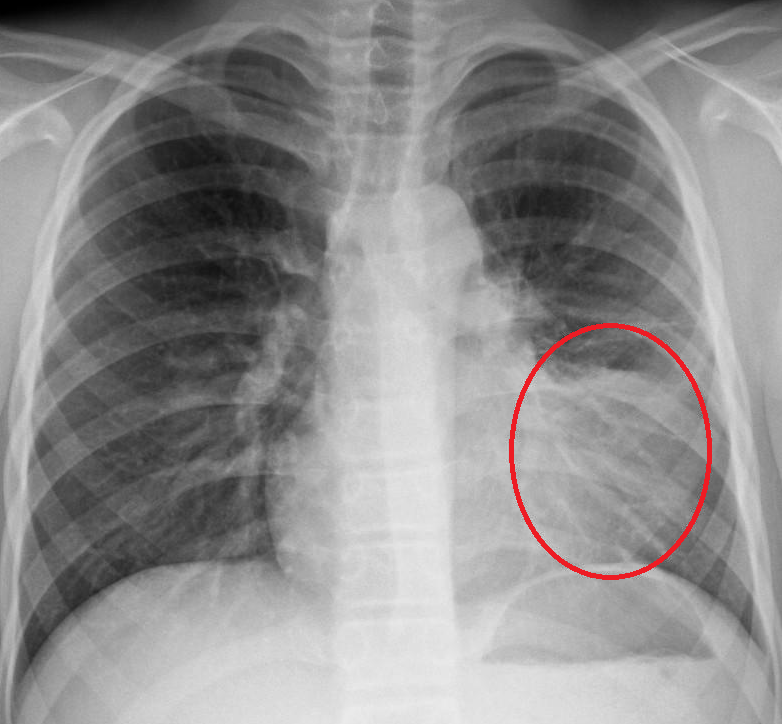 Patients with a suspected HAP will require a chest x-ray (CXR) to confirm the infection, presenting as consolidation*, either lobar or bronchopneumonia (Fig. 2). If a sputum sample is unobtainable, severe or non-responding infections may require a bronchoalveolar lavage, yet you should gain specialist advice before requesting this. The severity of a community-acquired pneumonia can be graded based on the CURB-65 score. A score 0-1 is mild, 2 is moderate, and ≥3 is severe. All patients should receive appropriate O2 therapy as indicated, targeting ≥94% saturation (or 88-92% in those at risk of hypercapnic respiratory failure). Any evidence of sepsis or septic shock should be managed and treated accordingly (discussed here). Any post-operative patients with prolonged bedrest or reduced mobility are at risk of developing HAP (secondary to fluid stasis in the pulmonary tissue). The best practice is for post-operative patients to have chest physiotherapy to increase lung ventilation and reduce fluid stasis. Aspiration of the gastric contents into the pulmonary tissue will result in a chemical pneumonitis. However, this is not necessarily an infection, as only if any oropharyngeal bacteria are aspirated into the lung tissue as well will a lung infection result. 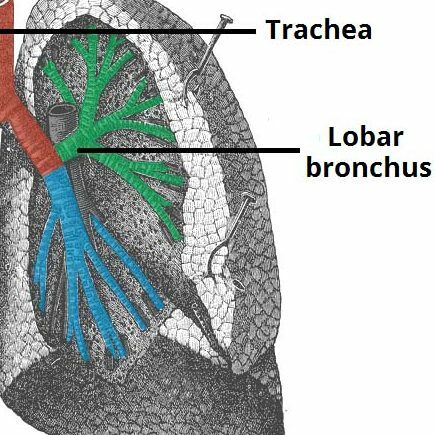 Classically, any aspirated content will affect the right middle or lower lung lobes, due to the anatomy of the bronchi (Fig. 3). Much of the clinical features and investigations for an aspiration pneumonia will be the same as for HAP. Importantly, aspiration pneumonia should be suspected over a pneumonitis if there is evidence of an infective process developing. Management is mainly preventative, identifying the patients who are at an increased risk of aspirating and placing suitable precautions (e.g. NG tube feeding) in place until suitable. This will require involvement from both the nursing staff and the Speech and Language Therapists (SALT). Any pneumonitis only needs supportive measures, however an aspiration pneumonia will need antibiotic therapy, similar to that of HAP. Suction of any aspirated contents is rarely performed as has no real benefit to overall outcomes. 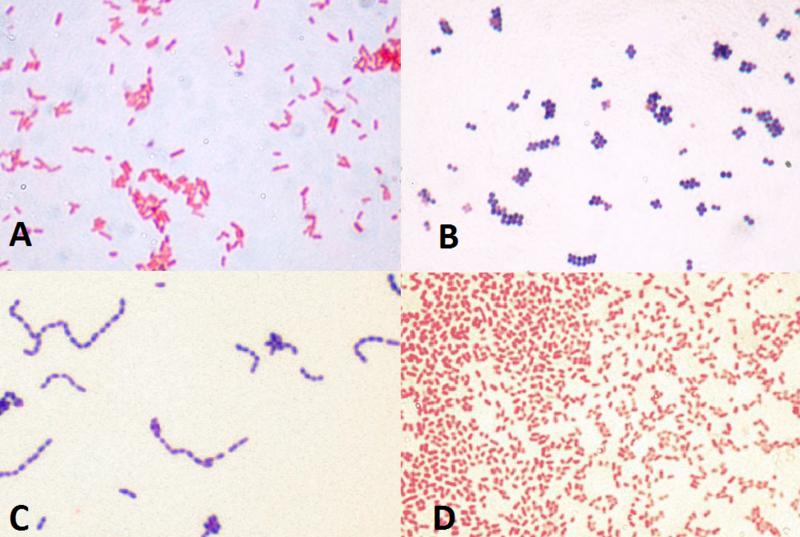 Which of these pathogens is most associated with hospital-acquired pneumonia? Which of these is NOT a risk factor for HAP (hospital-acquired pneumonia)? Which of the following blood gas results are typically seen in Type 1 respiratory failure? Which of these features differentiates consolidation from other shadowing on X-ray? A 60 year old woman, being treated for CAP, has new mental confusion, a urea of 8.1mmol/L, respiratory rate of 22 and a blood pressure of 95/65. What is her CURB 65 score? Which of the following is a common complication of pneumonia?